The name Laura Tenison conjures two thoughts. First is of her £34m childrenswear business, JoJo Maman Bébé, in all its Breton glory. Attention then often turns immediately to her ethical approach to doing business. This is the woman who made her staff peanut butter sandwiches every day for the first two years (until they politely asked her to stop) because she felt guilty not to be paying them more; the woman who chose her new head office in Wales based on its proximity to the homes of her employees; and the woman who set up a charity when she saw a problem she thought she could help fix in Mozambique. Laura Tenison has always been a go-getter. Born in London, her father’s career meant she lived in Romania, Germany and finally Brussels, before he retired when she was eight and the family moved to Abergavenny in Wales. “The problem with growing up in the countryside in effect as a single child [her brothers were at boarding school] is that you become quite bored.” But instead of allowing boredom to settle in, Tenison busied herself selling strawberries to truck drivers at the end of the drive, or making cakes to flog to neighbours. Then she learned to sew. “Although I was never very academic at school, I always got by with anything that was practical. So I was quite good at art and home economics, and I taught myself to sew by buying second-hand clothes and taking them to pieces, before using the bits as patterns.” By the time she was 14, she was making clothes not just for herself but for friends too. After six months, she quit and upon receipt of a tax rebate she went travelling to Syria, Israel and the Middle East looking at silks. From there she continued on to India, where she ran out of money, so booked herself a one-way flight to Australia. Having refilled the coffers by working Down Under for six months, Tenison made her way back to Blighty on the Trans-Siberian Express days after her 21st birthday. Tenison quickly moved through the ranks “irritating the HR department every three month by being moved into bigger and better jobs”. After two years, she decided she’d learned all she could and it was time to refocus on her own venture. But with little money in the bank, she decided to earn herself some quick cash by becoming a French property agent. The idea occurred to her when she was helping a friend buy a house in France. Armed with little but her fluency in French (a result of living in Brussels as a child) and some practical experience (she had recently renovated her London flat), she launched the business – to some raised eyebrows among the local tradesmen. “A 23-year-old woman, I was trying to be a builder in France with a team of 30 middle- aged tradesmen. I think there was some gender discrimination,” she recalls. “It took me quite some time to persuade these old boys that I was serious. But they got there.” Not only did she forge working relationships, but she was well-liked in the village near Brittany because she only used local materials and local labour – as opposed to shipping them in from the UK. “I built up a loyal customer base and had a lovely time wandering around drinking plum brandy with the locals,” Tenison says. But not everyone was happy about her choice of career. “My parents definitely didn’t think I had a proper job. They thought I should come back and settle down. Be sensible,” she says. Settling down a little did seem to be on the cards – at least in her personal life. Tenison married a man she had met on the way to Glastonbury when she was 23, and decided to return to England to live with him and finally start her menswear business. The sale of the property firm in France meant she had £50,000 to get cracking. But on the way to visit lawyers about the deal, she had a serious car crash. Flown back to the UK, she was very ill in hospital for three weeks, having severely damaged her legs, ribs, jaw and cheekbones. It was during her stay in St Thomas’s that she spoke to her ward-mate, a mother of two who was bemoaning the difficulty of buying clothes for her children from her hospital bed. Tenison wasn’t going to let immobility get the better of her, and she got straight out in her wheelchair, conducting market research – no mean feat with her mouth wired shut. What she discovered was that while women were keen for more choice in children’s clothing, what they really wanted was some decent maternity wear. And so JoJo Maman Bébé was launched in 1993 with a 24-page collection of maternity wear and two pages of baby clothes. As with lots of start-ups, those early days were a very hand-to-mouth existence. While the head office and design studio was in London, the warehouse was in Tenison’s native Wales. These days, business is certainly booming. 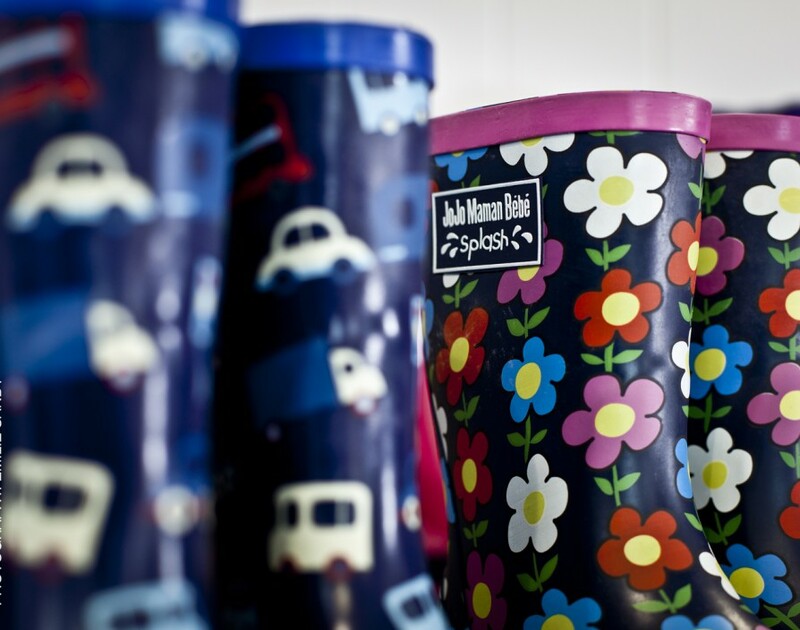 JoJo Mama Bébé’s head office has remained in Newport ever since the company’s inception, and the company is moving to a shiny new 90,000 sq ft warehouse in December having outgrown the 35,000 sq ft purchased in 2002. And even though the company is now 340-people strong, the small-business feel has remained. Some of Tenison’s first employees are still with the company (the very first is on the board of directors, no less) and all decisions are taken with the team in mind. As the team has swelled, sales have too. JoJo Mama Bébé will turn over £34m this year. At a time when many retailers are struggling, Tenison puts her business’s success down to a truly multi-channel approach. While the company has had an internet presence more or less from the beginning, it now also has 50 shops nationwide and still produces a ‘big-book’ 200-page catalogue. What’s more, difficult conditions in the domestic market have made Tenison turn to overseas expansion, and she has begun selling to independent boutiques and department stores around the world. “By hook or by crook, we’re in 52 countries – from New Zealand to several African countries. We’ve also just signed one in Central America,” she adds. This kind of tenacity has helped Tenison build one of the UK’s most recognisable childrenswear brands. And success didn’t come without an element of personal sacrifice, especially where her two teenage sons are concerned: “I’m very lucky that the industry I’m in has allowed me to spend time with my children. I don’t feel I’ve missed out on very much because I was able to juggle.” However, she admits that there were times she had to make difficult decisions. “There have been times when I’ve been on 10-day trips to China and I haven’t been able to be there for my children when I’d have liked to have been. But you have to accept that if you’re going to be determined about any career, whether it’s your own business or working for someone else, you do need to make some sacrifices,” she says. But one sacrifice she’s never made has been on ethics. Tenison is renowned for having embedded the idea of social and environmental responsibility into her business. “My mother was a frugal Scottish woman who brought us up with the motto of ‘waste not, want not’,” recalls Tenison. JoJo Maman Bébé audits all of its own factories and spends more on manufacturing so it can do so in a more environmentally friendly way. “I’m no tree hugger but I absolutely have the in-built ethic that you can do extremely well while doing good,” she says. Amen.